The Vilas County Sheriff’s Office is hosting this K-9 fundraiser event as a part of the St. Germain Chamber’s Colorama festivities. This fun 5K trail run/walk winds through our beautiful Northwoods landscape and finishes at the Colorama event. 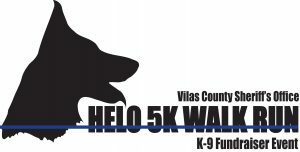 All proceeds from this timed event support the Vilas County Sheriff’s Office K-9 program. Registered participants will receive a shirt. Awards will be given. Registration is $30/person, $40/person after Aug. 25th and day of event. $100/family of 4-6. Pet friendly event with delayed start for those bringing their dogs!